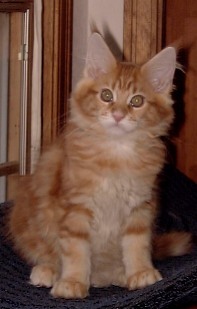 Aragorn is a red classic tabby male, son of Hana and Wills. This page describes Aragorn as he was when he lived with us as a kitten. 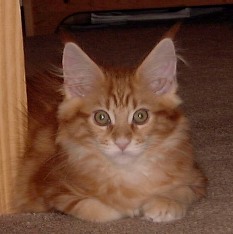 Like his littermates, Aragorn was named after a character from J.R.R. Tolkien's Lord of the Rings. Aragorn is the "fearless leader" of his litter. He is always the first to check out new things or situations. Although he really likes people, Aragorn is usually too busy for any really serious petting sessions. His style is more to "buzz" you while you're petting someone else -- he dashes up and, as often as not, just jumps right into your already full lap, annoying the current resident so that they get up and leave. Then after just a minute or two of purrs and snuggles, Aragorn has to get down so that he can resume his patrol of the room. Usually, the next item on his agenda is to attack your toes. Our kids have dubbed Aragorn "Airborne" because of his energetic antics.